This is another variation of my favourite Basic Gusset Heel sock, made from Araucania Ranco Multi. 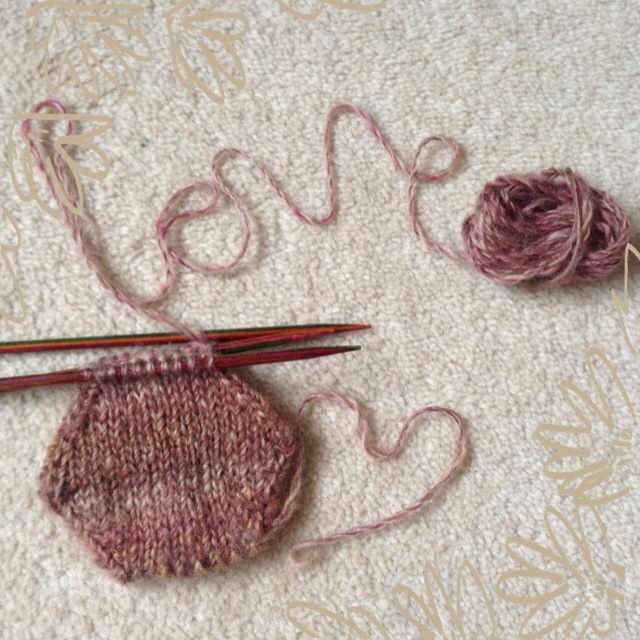 It's a sturdy sock yarn and using 2.5mm needles has resulted in socks that feel like they are made to last - which is a good thing! This is true mindless knitting and with each new pair I consider starting something challenging and then remember these are for my bag, and have to be easy to pick up and put down frequently. I've cast on another pair, but this time with a slight pattern on the instep - the Diagonal Lace Socks from the same book - the simple chart looks easy to remember. Let's hope. Those following on Facebook and Instagram will have already seen my extreme delight with another little project yesterday - a hexipuff made from my own handspun yarn. I am ridiculously excited by this and it feels amazingly soft and scrumptious. For those who have asked, the fibre came from Shamu Makes. I've had lots of people comment, email or tell me in person that they are inspired to start spinning after seeing how quick it can be to progress from lumpy thick-and-thin "rope" to useable finer weight yarn, and I would heartily encourage anyone who is so inclined to give it a go - especially if you already enjoy knitting with different yarns, as there really is nothing better than something you have spun yourself. I can't wait until I have enough to make something bigger - perhaps Faraway so Close...? I'll be back over the weekend with a few new posts including Pin It Forward UK, and a room makeover competition which has me running around like a headless chicken today. Hope to see you then! 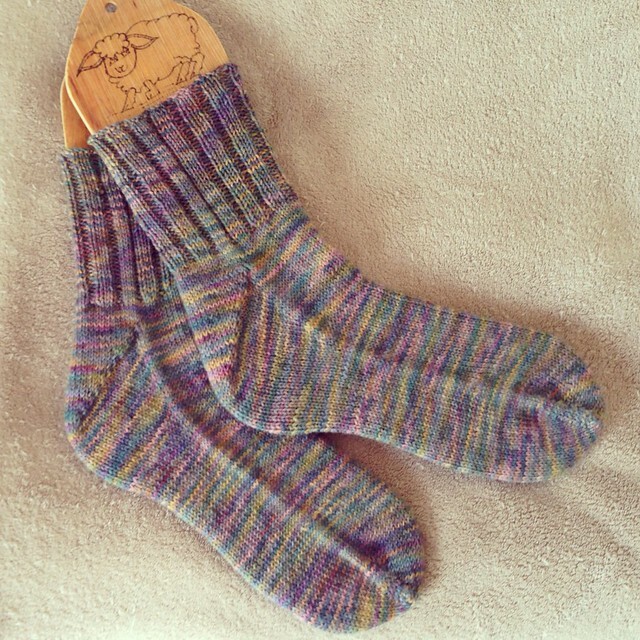 Fab socks :) A FASC with handspun would be beautiful! Great socks! I have just finished my handbag ones too, they took longer than I would have liked, but you are right - eventually is what is important! Exactly - I like to think of them as an "extra" project! I know! They are better for lacy socks, but I tend know not to knit lacy socks! Great for photos though!!!! I'd love to know how washable Ranco is, because I have several skeins in assorted colours that would make great socks, but only if I can lob them in the machine as I strongly object to hand washing socks. Seeing you jump into spinning reminded me of my beginning spinning days (about a year and a half ago) and inspired me to get back to picking up my spindle and spinning at least a little bit every day. It's easy to just forget about it and not do it (after a while) so thank you for the reminder of how much fun it is! Delightful outcome of a take along project. I just looked at the pattern page and am sad to see it is in a book. I can't purchase it right now but I am looking for a easy, toe-up sock pattern to begin my first ever pair of socks. Well done on the spinning too--an real accomplishment for sure. I will get drop spindle spinning some time this month! You are definitely an inspiration and another blogger who I need to look up.